× Easter Ordering Information: To all order placed before 1pm on Thursday 18/4/19 will have an expected delivery for Saturday 20/4/19. All orders placed after 2pm on Thursday 18/4/19 - Tuesday 23/4/19 will have an expected delivery for Wednesday 24/4/19. 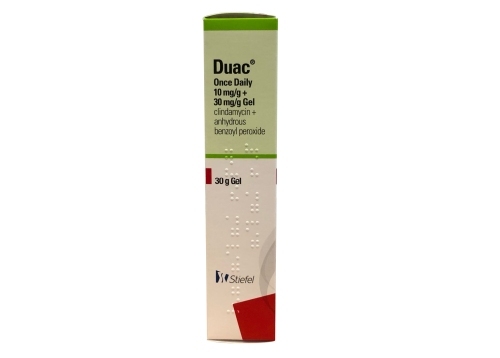 Duac is a gel that is used to treat mild to moderate acne. It is only available on prescription after you have had a consultation with a clinician, who has assessed your suitability for the product. Acne is a build-up of an oily substance called sebum, and a bacteria known as Propionebacterium acnes. 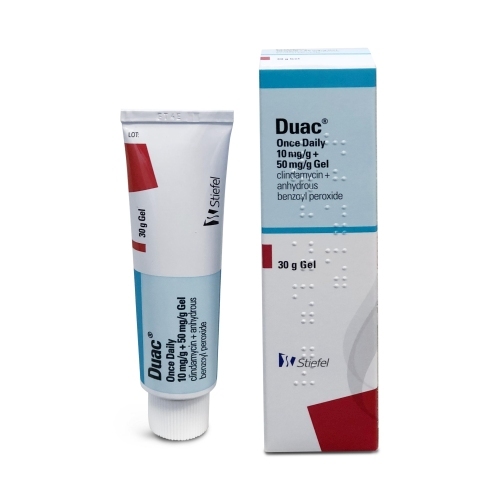 Duac gel has two active ingredients, benzoyl peroxide and clindamycin. Clindamycin is an antibiotic that works to fight the bacteria associated with causing acne, as well as decrease acne related swelling. Benzoyl peroxide treats acne by acting as an anti-inflammatory agent, and uses a process called oxidization to help reduce flare ups. Oxidization is where air is injected into pores, loosening the material inside. This makes it easier for the bacteria, oil and dirt to exit the pores. Benzoyl peroxide also works to reduce blackheads and whiteheads, and uses it’s antibacterial properties to help Clindamycin create an environment that is unfriendly for bacteria. Overall, the two ingredients contained in Duac work effectively together to reduce the swelling and bacteria caused by acne. How do I use Duac? Wash your hands with antibacterial soap. Remove make-up, cream, or any other products that are on the face, using a gentle hypoallergenic face wash.
Rinse the face with arm water and gently pat dry with a clean towel. Using your figertip, apply a thin film of Duac gel to the affected area. Ensure that you have covered the entire area, and not just applied Duac gel to individual spots. If the gel does not rub in easily, you are using too much. For larger areas, such as the face or back, the same principal applies, except you should use two and a half finger tip’s worth of gel. Avoid using the gel on broken, sensitive or sunburnt areas of the skin. How long does it take for Duac to work? Duac typically has a response time of around two-six weeks. You should be persistent and apply Duac every day in order to gain the maximum benefit of treatment. If you haven’t seen any improvement after six weeks, you should stop using Duac gel and make an appointment with your doctor. How long should I use Duac for? This depends on the recommendation from your doctor. All skin types are different, and responses to treatment may vary, so it’s important to have an assessment from your GP to find out how long you should continue to use Duac for. Do not use Duac for more than 12 weeks unless your doctor has told you to. Duac has been used for a number of years, and has proven to be one of the most effective treatments for acne. It’s important to note however, that skin types vary amongst individuals, which means that responses to certain treatments may also vary. If Duac hasn’t worked for you, don’t be disheartened as there are many other treatments available which are just as effective. You should make an appointment to visit your GP who can advise you on alternatives. Who should not use Duac? Is Duac safe to use whilst pregnant or breastfeeding? Unfortunately, not much is known about the safety of using Duac whilst pregnant or breastfeeding. If you are pregnant or breastfeeding, you should visit your GP who will asses the benefit of your treatment with Duac, against the potential risk caused to the baby. If your doctor has advised that it is safe to use Duac whilst breastfeeding, you should not use it on your breast region. Can I use Duac with other medication? You should speak to your GP about any OTC or herbal treatments that you are using to find out if they are suitable to still use at the same time as Duac. Duac is making my skin irritated, what should I do? Dry and peeling skin is one of the side-effects of Duac. You should use a moisturiser that is free from oil and fragrance. Skin friendly moisturisers are known as “hypoallergenic”, and you can usually find this word written on products that are suitable for you to use. If you are experiencing any other form of skin irritation as a result of using Duac, you should stop using it and visit your GP. What if I forget to use Duac one evening? If you forget to use Duac, you should not use double the amount or use any more cream than you have been prescribed to use. Apply the cream the following night as usual. Forgetting to use Duac as a one off will not impact your treatment in the long run, however, regularly forgetting to apply Duac can. You should set a reminder on your phone to ensure you don’t forget. Can I use Duac after shaving? You should leave a few hours gap between shaving and using Duac. It is recommended to shave in the morning, as Duac is applied in the evening. This timeframe is sufficient enough to minimise the irritation that can be caused to your skin by applying Duac shortly after a shave. Can I use make-up after applying Duac? Duac is most effective when used at night, right before bed. However, if for whatever reason you wish to use make-up after having applied Duac, you should ensure that the Duac gel has dried, and apply make-up that is non-greasy in texture. What else do I need to know whilst using Duac gel? Duac may bleach clothes, bedding, towels and hair. Be careful to ensure Duac does not come into contact with hair, or fabrics that are valuable. Where can I buy Duac gel? You can buy Duac online from our registered pharmacy. Before our clinicians can prescribe this, you will need to fill out a short online questionnaire, which will determine your suitability for this product. © 2018 BY CHEMIST CLICK. ALL RIGHTS RESERVED.